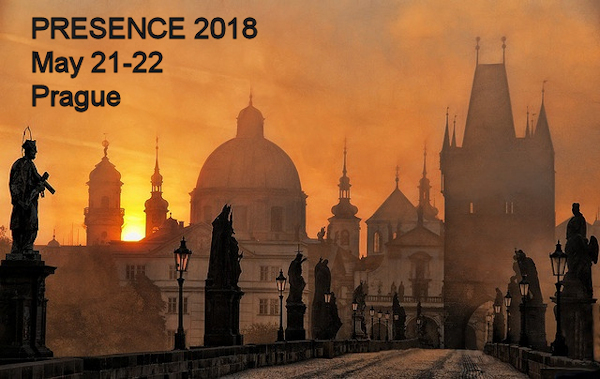 [We’re looking forward to seeing many of you in Prague in two weeks for PRESENCE 2018; the conference program, which emphasizes collective knowledge development through not just presentations but informal discussions, some over good food and during sightseeing (! ), is below. It’s not too late to join us, in person or virtually: Online registration is available via EventBrite and if you can’t be in Prague, join us for a (free) ‘virtual’ discussion about presence via telepresence tech. If you’re already registered, please complete the Attendee Sightseeing and Meal Choices Survey before May 11. 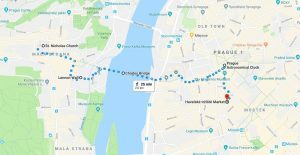 Call: PRESENCE 2018 Conference Updates!! The submission deadline for the PRESENCE 2018 conference in Prague is coming up soon (and may be extended if we get enough requests). The organizing committee is busy planning a useful, interesting and fun event, and we’re looking forward to seeing many of you there! The call for papers (below and on the ISPR website) has been updated with submission templates for MS Word and LaTeX, new information about hotels near the conference venue, new destinations for the informal group sightseeing the day before the conference begins (mmm, chimney cakes! ), and more. Big news…! Full details and the official Call for Papers will follow soon but the Board of Directors of ISPR invites you to join the presence community as we meet next May in Prague!